HARRISON, N.J. – The New York Red Bulls II overcame a halftime deficit to sweep to a 4-1 victory against Indy Eleven on Sunday afternoon at Red Bull Arena to remain undefeated at home this season while handing Indy its first road loss of the season. The Red Bulls II had the better of the early going, but Indy took the lead in the 21st minute on its first shot of the game as Soony Saad curled a finish into the top-right corner of the net. The Eleven almost doubled their lead 13 minutes later as Jack McInerney got in behind the defense but Red Bulls II goalkeeper Evan Louro kept out his finish from a tight angle, and New York forced a good save by Indy goalkeeper Owain Fon Williams as Andrew TInari got a clear look from the right side of the penalty area. The hosts also had a chance cleared off the line as Hassan Ndam won a header from a corner kick for Brian White to redirect toward goal just before halftime, McInerney providing the last-gasp clearance, but White struck for his fifth goal of the season in the 57th minute as an errant defensive header allowed him to steal possession ahead of Fon Williams’ challenge and finish into the open net. Three minutes later, New York took the lead as a handball in the penalty area on a shot by Rivas saw the hosts awarded a penalty kick, and Rivas sent Fon Williams the wrong way with a low shot to the left corner. Indy was reduced to 10 men when Nico Matern received his second yellow card of the game with 17 minutes to go, and while the game then opened up and saw both sides have chances to find the net, New York put the game away as Amando Moreno tapped home from Jared Stroud’s low cross through the six-yard area with seven minutes to go. The Red Bulls II then added the icing to the cake in stoppage time as Tom Barlow scored his first professional goal to cap a big victory for the hosts. 1. Having gone five games without a win, and having scored only two goals in that span, Sunday afternoon’s victory was an important one for the Red Bulls II as they moved back into the playoff positions of the Eastern Conference. It was a victory the side’s performance merited, too, as the host’s pressure put Indy under duress, which in turn ended up paying off with two goals in three minutes to overcome a halftime deficit. There are still defensive issues to be worked on, but the Red Bulls II got back to doing what they do best to move to 4-0-1 on home turf this season. 2. Indy saw its undefeated road record evaporate in the span of three minutes that saw the side make uncharacteristic defensive errors that saw the Eleven also concede away from home for the first time in 2018. From a weakly headed pass by that allowed Brian White to steal possession and score, to a giveaway that resulted in a penalty kick via a handball, it was a spell for Indy to forget as it suffered a second consecutive defeat for the first time this season. 3. New York’s press cuts both ways, as when Indy was able to break through the midfield it regularly led to good chances for the visitors, but more often it meant the Red Bulls II won possession in advantageous positions that allowed the hosts to dictate the terms of the game for much of the contest. 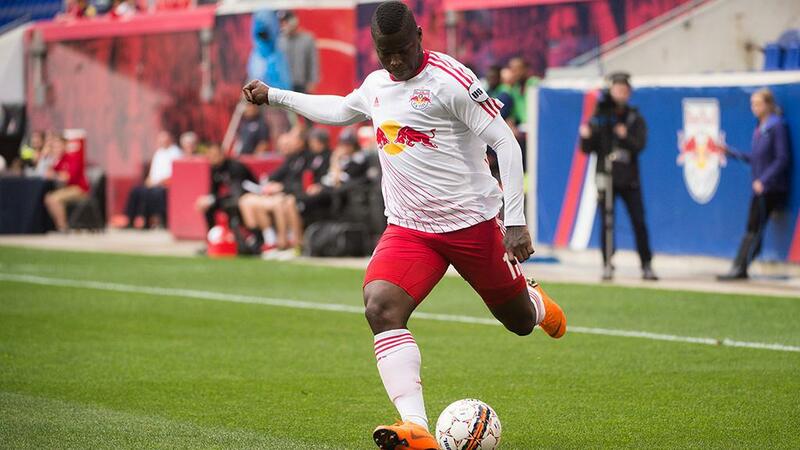 New York recorded 28 interceptions and possession recoveries in the Eleven’s half, which helped the Red Bulls II record a sizeable advantage in possession and a 30-4 advantage in total shots that ended up overwhelming the Eleven on the day. Brian White, New York Red Bulls II – White began the Red Bulls II’s comeback with the opening goal, but also completed 24 of 25 passes overall and created four scoring chances in addition to his goal in a great all-around display.